They do, however, self-position differently on a left (0) – right (10) scale, with new members seeing themselves as significantly more left-wing (1.95) than older members (2.39). And if we isolate only Momentum members (10%), this difference is even more accentuated, given that they self-locate a full point further to the left than older members (1.39). Thus, in terms of subjective self-image, which probably embraces more than just state-market opinions, the new members see themselves as something of a leftist vanguard. 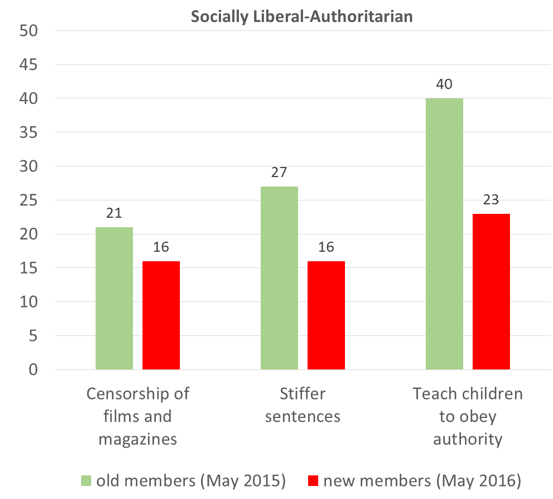 New members are, in fact, decidedly more socially liberal than older ones on a few central issues: they are considerably less keen than old members on introducing censorship of films and magazines (16% vs. 21%), stiffer sentences (16% vs 27%) or teaching children to obey authority (23% vs 40%). The two groups seem, however, to have similar positions on considering immigration a good thing for the economy (5.7 vs. 5.8 on a scale running from bad (1) to good (7)) and for the UK’s cultural life (5.6 vs. 5.8). Old and new members tend to participate similarly in online political activity: (Facebook 51% vs. 53%; Twitter 37% vs 33%). When it comes to offline participation, however, there is a striking difference: new members are plainly not as keen to get stuck in. While a third (31%) of the old members attended a public meeting during the GE campaign, less than a sixth of new members did so during the campaign for the 2016 local/regional/mayoral elections (15%). Although less was presumably at stake in 2016 than 2015, an even wider gap is registered when looking at activities such as leafletting (42.5% vs. 16%), displaying election posters (51% vs 26%) or – most notably of all – canvassing voters (35.7% vs 9.3%). The preference for clicktivism over other forms of activity, however, is much less pronounced for those who are Momentum members. Although these people do tend to participate more in online activities than everybody else (Facebook 67%; Twitter 50%), the gap with older members’ participation in offline activities is much smaller (displaying election posters 38%, leafletting 35%, canvassing voters 29%); indeed, Momentum members were actually more likely than old members to have attended public meetings (35%). Whereas the new members are more likely to believe in general terms that politicians don’t care what people like them think (42% vs. 31%), they are much happier with what they’re getting from the Labour leadership than members in 2015. Not only did three quarters of them join the party because of belief in the party leadership (76.5%), as opposed to only 42.5% of old members – the difference between Corbyn and Miliband (and his predecessors). They are also much more inclined to believe than those we surveyed back in 2015 that the Labour leadership respects ordinary members (40.3% vs. 16%). Relative deprivation theory suggests that people tend to make comparisons between what they expect out of life and what they actually experience, looking at people who are rather similar to themselves for cues as to what to expect. Thus, university graduates tend to derive their expectations from looking at other graduates and risk frustration if these expectations are not met. Did a sense of relative deprivation trigger some graduates to join Labour in the hope that the Corbyn leadership would help render their actual economic conditions closer to their professional expectations? Possibly so. The proportion of graduates among Labour members earning less than the average salary (around £25,000) is 10 points higher among new members than among older ones (51% vs. 41%). And a considerable gap also exists between pro- (54%) and anti- (41%) Corbyn new members. In short, the Corbyn leadership has attracted similar people in terms of age, education and occupational class to those who were Labour members in 2015, although new members are slightly less well-off and more gender balanced than the past. New members are similarly left-wing on the state-market dimension, although they are more likely to regard themselves as further left and are certainly somewhat more socially liberal than older members. Although they tend to participate mainly online and not so much offline, this is less true for those who are also members of Momentum. Clearly, the new members are confident that the new leadership respects them and this is something that distinguishes Corbyn from most other politicians in their eyes. Finally, there is some evidence that the educated left-behinds might have been particularly moved to place new hope in Corbyn. How long they keep the faith, and what that means for the Labour Party, remains to be seen.